Anyone who supports President Donald Trump, and even his critics, are familiar with his promise to end the corruption that infests Washington D.C. “Drain the Swamp!” was the rally cry, the aspiration of millions to see our federal government rid of self-serving politicians, lobbyists, corporate leeches, and various other special interest groups. The American people want control over their government: they want to see it working for them, and not as merely a tool for the well-connected in D.C. to stuff their pockets and off-shore bank accounts. How successful has this effort been? 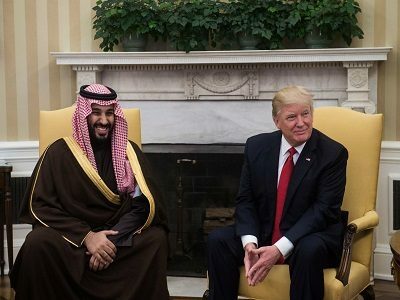 This article will compare the corruption problem in the U.S., and juxtapose it against analogous developments in Saudi Arabia. As a new prince, Mohammed bin Salman, was crowned by his father, Salman bin Abdulaziz Al Saud, of Saudi Arabia, he was determined to tackle endemic corruption for a variety of reasons. For example: the Saudi people desired liberalizing social reforms, especially for Saudi women, and the ruling family was determined to end the culture of rampant financial corruption that had cost the Saudi government billions – in some cases, these financial dealings were also intertwined with geopolitical rivals Iran and Qatar. The data below compares the problem of corruption in the United States and Saudi Arabia, and the respective approaches taken to correct it. Conservative estimate. See calculation below. In fact, it is the Trump administration and former campaign associates who are under investigation by Special Counsel Mueller and the politicized heads of the FBI. Attorney General Jeff Sessions has not made it a focus of the Department of Justice to investigate government corruption, and finally prosecute suspects. Despite ample evidence of corruption in the Clinton campaign, among Hillary and her surrogates, no charges have thus far been forthcoming. Approximately 500 Saudis have been arrested, including at least 11 princes. More than 2,000 accounts have been frozen and/or seized. The prisoners were held in the Ritz-Carlton hotel in Riyadh. However, the hotel is now accepting reservations beginning on Feb. 14, suggesting that the procedures are concluding. Remaining prisoners have been transferred to actual prisons. After settling with authorities, all but Prince Al-Waleed bin Talal (who continues to refuse to pay the reported demanded $6 billion) have been released. As the DOJ has not prioritized corruption, no savings can be attributed to funds recovered. However, nearly $7 trillion of value has been added to the stock market, resulting from less regulation and business-friendly climate. It is estimated that hundreds of billions $USD have already been recovered by the Saudi government, helping to address budget deficits resulting from lower oil revenue. Saudi Binladin Group – Bark Bin Laden: The government forced the company to cancel $30 billion owed to it by the government. Not content with the reaction of the company’s management, i.e. the Bin Laden family, to the debt cancellation the government seized the entire company and it is now owned by the state. A swamp, by any other name, still stinks. In Saudi Arabia, the Prince calls the problem by its plain and well-understood adjective – “corruption.” In Washington, the euphemism “swamp” is applied, but it cannot change the character of criminal activities and abuse of office. In Saudi Arabia, the Prince has targeted corrupt officials and royal family members as well, regardless of title, position, and social status. The results speak for themselves, and it appears that within the course of approximately three months the operation has nearly concluded. Additionally, the government of Saudi Arabia will likely seize in excess of $100 billion of ill-gotten gains in the form of cash and assets. Although the Trump administration issued executive orders aimed at curbing corruption, the swamp continues to operate largely unfettered in Washington today. The Saudis applied a systematic method to clean up their government and society. What would an American equivalent of such an operation look like? No doubt, it would be legal and transparent. If there is to be a change in business-as-usual in our capital and government, it is up to President Trump and Attorney General Jeff Sessions – or his replacement – to develop such a plan. *Note: Estimating the number of corrupt federal officials (elected or otherwise) in the United States is difficult and controversial, but below presents a model for a conservative estimate. There are a total of 535 Congressmen/women in the House of Representatives (435) and the Senate (100). The incidence of reports, both confirmed and unconfirmed, of corruption suggests that a significant number of Congressional leaders have engaged in corrupt activities. Figures relating to personal wealth of various Congressional leaders also support this assumption. For the purposes of discussion, let’s assume that one-third, or 175 Congressmen have illegally profited from their elected office (a conservative figure). Let’s further assume that for each of these 175, there are on average two prominent lobbyists (350), bringing the total to 525 (175 + 350). There are approximately 2.7 million civilians employed by the federal government. Let us assume that 1% are in a position to abuse their position for personal gain (27,000). Furthermore, let’s assume that 5% of these eligible persons have engaged in corruption – 1,350. Without further estimation, that would bring the total estimated number to 1,875 (525 + 1350).